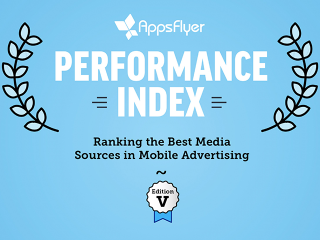 Mobile analytics company AppsFlyer released the fifth edition of its Performance Index Report, revealing the top media sources in mobile advertising. The report analyzed more than 6 billion application installs and 80 billion sessions from the first half of 2017, and it found Facebook is still the No. 1 media source for app marketers worldwide, followed by Google. The report combined volume, retention and average sessions per user to create overall power rankings of the top 10 media sources in both the gaming and non-gaming categories. While Facebook and Google have always made it to the top slots, the two giants are dominating the mobile ad space like never before. Our new ROI (return on investment) index indicates that Facebook and Google reached the Nos. 1 and 2 spots on Android and the Nos. 2 and 3 positions on iOS, respectively. While the two titans are at the top of the rankings across the board, their dominance is even more prominent in the non-gaming category. Facebook’s and Google’s share of installs in non-gaming was 70 percent higher than their share in gaming. When looking at operating systems, their share on Android was almost 50 percent higher than iOS. Lastly, examining the data regionally shows that Latin America has the highest share of installs coming from Google and Facebook, followed by Asia, Western Europe and, lastly, North America. Users interested in viewing AppsFlyer’s full Performance Index Report can do so here.